Another vegan baking disaster (sorry vegans). Now don't get me wrong, I do like carob...but these muffins were horrible. They were stiff, bread-y, dry, and barely sweet. In fact, the only sweetener used was apple juice concentrate...definitely not enough for these. At least I only made 6 of them, so I didn't cringe too much when I threw them all out. Make again? Okay seriously...these things tasted like paste. I mean, look at the pic, they look like clay balls! 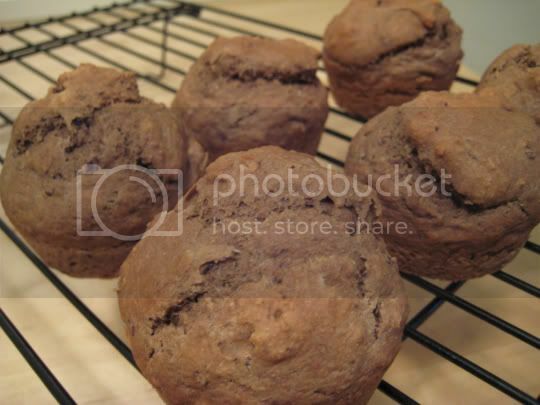 "Carob Muffins," Table for Two: Meat- and Dairy-Free Recipes for Two, Joanne Stepniak. Book Publishing Company, Tennessee, 1996.